Barbara Cole "Battersea Garden Diptych"
MONTREAL, QUÉBEC – September 7th, 2018 – Artist Barbara Cole will be bringing her iconic underwater photographs to Montreal next month at Galerie LeRoyer from October 18th to November 1st, 2018. This exhibition will also celebrate the launch of Cole’s newest monograph, Submerged: Four Series of Underwater Photographs, which includes works from her most recent series Figure Painting, Falling Through Time, Miroir d’eau / Meditations, and Duplicity. Cole is widely known in the art world for her mesmerizing, ethereal underwater images that have garnered international critical acclaim. Each series hones in on a powerful narrative, some with outward subjects and others with such intense figure transformations that space and composition alone tell the story. The exhibition places Cole’s series side-by-side in a continuous dialogue that develops through changing and progressing scene, story and subject. Cole’s painterly photographs lend themselves to the romantic culmination of personal and fantastical reflections, placed inside a frame to be experienced by viewers. Her photographs emulate painting both technically and aesthetically, as Cole works underwater to manipulate the light in her constructed yet organic compositions. Cole uses water as her natural lens to explore and transform figurative qualities, and to re-envision the nature of our relationship to our surroundings. Cole’s series are crafted all within lens, avoiding digital manipulation as much as possible. With Cole’s background, her process effectively channels her experience with single-handedly creating a particular atmosphere through costume and set couture. 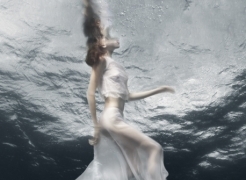 Barbara Cole is a Toronto-based artist with a background in fashion and editorial photography. She has participated in exhibitions internationally, across Canada and in the US, including a recent successful appearance at Photo London, shows at the Canadian Embassy in Tokyo as well as the Canadian Embassy in Washington DC, Art Toronto, Context Art Miami and sprint 2019 in Jaffa, Israel.